Awhile back ago, I fell in love with Caleb and Maggie’s story in the Significance series and now, I’m so excited to see the story continue with their daughter, Ava. 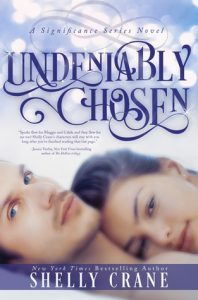 On March 31st, Undeniably Chosen will be hitting our ereaders and I can’t wait to see what Shelly Crane has in store with us. I have an exclusive excerpt for you below, plus a giveaway for a signed paperback and Significance scarf! “Oh, yes I can!” she sang happily. I tried not to let the eyes on us deter me from being my normal self with him. He didn’t seem to notice everyone as we washed our hands and moved into the kitchen. He watched me get everything ready, watching my fingers and then my face, then my hands again, and my face with interest. When our eyes would meet, he’d smile. Everyone was so bad at trying to look like they weren’t watching us like their favorite soap opera. When I had the buns on the plate, I took a few of Dad’s ribs, cooked to perfection, and pulled the meat from the bone with my fingers. He moved closer, his fingers cupping my elbow. I sucked in breath through my lips and looked over my shoulder to his face—so close. His face was dark, his eyes were hooded, and his lips were pout—almost comically so. It was such a stark contrasting about-face to where he was not two minutes before that I opened my mouth to ask what was wrong. But he stopped me. He smiled. I am completely serious. I know and that’s why you have to stop. You’re making me totally crazy. I shook my head. His shoulders shook with a silent laugh. “Do we need to keep score on that, Miss I’ll wear tights every day to torture you?” he said aloud and Dawson laughed into his fist, not knowing what we were talking about, but he was close enough to hear and got the gist. “No.” I smirked. “No, we don’t,” I said coyly and bit into my lip smartly as I turned. Uhoh. I started something, didn’t I? I looked at him and he was thoroughly enjoying this. Baby, you started a war. He laughed out loud, kissing my temple, and staying right behind me as I finished them. His hand was on the counter next to my arm and I swear, the parts of us that weren’t touching were crackling with electricity. I put another piece of meat on the buns, licking my finger, pretending that I hadn’t heard his small groan in my mind, and then reached for Mom’s coleslaw. He reached for it, too, since he was taller. “I got it,” he said in my ear. He squirted it on mine and then eyed it. “I guess I can give it a try.” Then he squirted it on his as well. He gave me a sideways smile that was filled with happiness and everything I hoped I would see shining through. “How did you…” I shook my head. “You’ve got to stop doing this,” I barely murmured through my numb lips that wanted nothing more than to drag him away to a dark corner and kiss him until he could no longer breathe. “Stop doing what?” he whispered back, taking the ends of my fingers in his. I’m so excited for this book! Been too long since I hung out with the Jacobsons! Thank you for the excerpt and the free and sale alert on the series. Thank you so much, Vilma! !